BSSK Recruitment 2016- Post For Computer Operator, Branch Officer Last Date 15th August 2016 Apply Online. Recruitment Board:- Bhartiya Shiksha Evam Swasthya Kalyan. 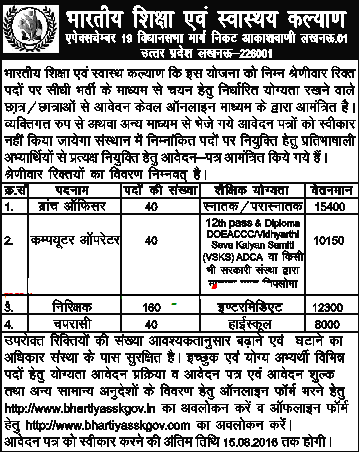 Bhartiya Shiksha Evam Swasthya Kalyan (BSSK) Recruitment 2016-2017 Has Published Recruitment Job Notification Invited Application Form For Post Of Computer Operator, Branch Officer And etc. All Candidates Are Required To Check Recruitment Details for BSSK Job Advertisements and Apply Online Before Or As On 15th August 2016. Candidates Are Applying For BSSK Recruitment 2016 Should Be Check Vacancy Recruitment Details Like- Recruitment Qualifications, Exam Pattern, Exam Syllabus, Age Limit Details, Selection Criteria, Selection Process, Application Fees, Pay Scale, Apply Process, Exam Results, Exam Date, And Other Details Before Applying. This Information Are Given Below (For More Related Jobs Check on www.jobssetup.com). Total No.Of Job Post:- Total Recruitment 280 Posts. Job Location:- Lukhnow, UP (India). Age Limit:- Age Limit Details is Not Describe in Job Advertisement. Pay Scale:- According The Job Notification Approximately Per Month Salary is Rs.15,400/- (For Post No.1), Rs.10,150/- (For Post No.2), Rs.12,300/- (For Post No. 3), Rs.8000/- (For Post No.4). Application Fees:- According The Job Notification General And OBC's Category Candidates Application Fees is Rs.-500/- And All Others Category Candidates (ST/SC) Application Fees is Rs.- 300/-. How To Apply:- Applicant All Candidates may fill the online application form through official websites, The Official Website is-//www.bhartiyasskgov.in. before or as on 15/08/2016. Job Related Any Other More Information Go To Official Websites Or Job Advertisement. Important Dates:- Last Apply Dates- 15/08/2016.